Ah, confidence, confidence. How do we acquire it when needed? From where does it spring? How do we keep hold of it during difficult times? 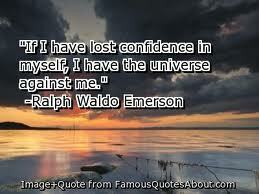 Ralph Waldo Emerson’s comment, that the universe is against he who does not have confidence, is strking. We are battling not only the universe, it seems to me, but also ourselves, when we lose confidence in our ability to achieve, to provide, to be a good friend, parent, employee or boss. I have been musing these various matters lately as my teenage daughter approaches the end of the school term and has been engaged in all manner of social events – proms, belated birthday parties, celebrations to mark the end of exams, celebrations to mark the last formal day of school, celebrations for celebrations sake. Yet, despite this joyous time and great spirit of adventure and freedom, there are some who have not taken part in the many social events on offer: those who stayed home alone on Prom night; those who did not attend the leavers’ lunch; those who shied away from end of exam celebrations. There are some for whom, the whole social whirl of this time of year has been too much to bear, a painful reminder of the absence of friends, the absence of the right wardrobe, the absence of confidence. Of course, I begin these posts with great and good intentions that I will address so many matters and then my word count rises and needs must, there is this paring down of what matters most to say. Confidence it seems to me, comes in many forms, and from many sources. If confidence is not instilled in us, through our parents, our family unit in the early years, how much harder it is to acquire later in life. In guarding against the loss of our self confidence it is useful to consider where still do we feel confident? From where, or from whom, can we borrow confidence, until ours is retored, made plentiful again? We see often young people who alone are timid and hesitant about accepting new social invites, but armed with a group of friends, or one good friend, accept readily whatever comes their way. This act of ‘borrowing’ confidence from another, is common to us all. Some of my 8 keys to confidence may present as rather vacuous, or be regarded with dismay. How can possessions be a source of confidence? But many will know the look of joy on a young woman’s face when presented with the perfect shoes, the most exquisite dress, the most wondrous bag? We gain so much of our confidence from our appearance, from how we look, from the possessions we acquire and adore. It would be foolish to think that we do not, but of course, the secret to holding onto our confidence, is to have still that great air of significance, or worth, when our possessions are lost to the past and our looks are but a distant dream. We gain much of our early sense of self worth and confidence from our parents, from those significant adults in our life. Our family and our friendships afford us confidence. Those who have many friends and friendships from different social groups, have much to feel confident about and have that confidence reinforced each time they re-connect with their social group. Those who have fewer friends are much more vulnerable to the heartache and despair of social anonymity, of isolation, are much more likely to be on the outside, looking in, as others enjoy the rewards of their social success. From our social success, there is a gain that gives even greater confidence, and that is in the status we acquire amongst our peers. In the business world, status is everything, but even amongst the young, there is a status to be acquired in the classroom or on the playground. At its most positive, developing a reputation and status in a particular field is important to success, to credibility, to professional longevity. At its worst, status corrupts the minds and behaviours of our most vulnerable in society, and is the cause behind some of our most feared and violent gang related crime. In my work with children and young people with special educational needs, I have commented often in assessment advice on the ‘need for an increased self-confidence, across a range of contexts’. That range of contexts is an attempt to guide change and is significant. I may be challenged at times, with the comment from parents or teachers – ‘oh, but he is incredibly confident – wait until you see him at home/riding his bike/on the farm…’ Yet that confidence is not seen in the classroom, is not seen in that young person’s expectations of their own academic success, is not seen on the playground, where friends are few and far between. Confidence can be static, confined to single isolated situations or contexts. The confidence this child has can be seen to originate from knowledge and specific skill sets, but it may not be enough to protect that child from the taunts and teasing of the playground, of the wider social world of the school. Confidence that comes from our knowledge and our skills may be said to be enduring, long-lasting, and it forms as a protection of sorts, against an erosion of our self-worth. We have a value in what we know, in what we can achieve, in what we can do. But in itself it is still not enough. Like our isolated child in the classroom, confidence in one context does not protect from an absence of confidence in another. There is a need always to think, how can this confidence be transferreed across a range of contexts? I rather like this quotation from the late Arthur Ashe. 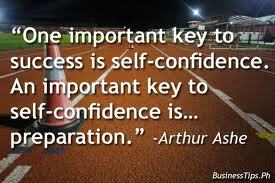 Self-preparation as an important key to confidence. In sport, as in business, preparations are the key to success. There are no short cuts and no quick fixes. Time spent on preparations is essential, even if that does not attract the crowds, or is valued by clients. Finally, I must mention love. 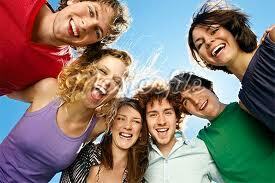 Who has not felt an abundance of confidence at the same time as feeling an overwhelming sense of love? It may be the love of a mother for a new born child, the love of a parent for a child who has surpassed all expectations, the love of one person for another, the first love of teenagers, the love of good friends. In others, we gain confidence. To others, we give confidence.